The ISBI Challenge Shall Be Reborn! UPDATED JULY 25th, 2006! REVISIONS ARE IN RED! Note: I made the decision to revise a couple things to make the game more... streamlined, I suppose you could say. There are also a few things added just for clarification purposes. What's this about anyway? : The point of this challenge is to try to manage an entire household through several generations while only having one character under your control. Other household members must rely entirely on their artificial intelligence (or lack thereof), while their wants and needs remain forever hidden. Do you have what it takes handle all the responsibilities of a sim household from one sim's perspective? Pass along the torch of awareness and keep the family going. What about Hacks & Cheats? : If it looks/smells like a blatant cheat in regards to this challenge, it probably is. Use common sense and you should be fine. I use many hacks myself, so I wanted to make a challenge that was as hack friendly as possible. Most of all, I dislike strictness with anything. This is all for fun, so have fun with it in your own way, then share your experiences. In simple terms: No money cheats, no mood/aspiration cheats, and no grade/performance/career cheats. Please avoid mods that significantly assist your sims' AI. Such as the Baby Controller, or hacks that tell your sim when they should go to bed, and so on. Things such as the 'No Stranger Dance', 'No Napping' mods, or others like it are fine. One other thing. No reloading the house if something bad happens. Game Over: The only automatic game over is if your Torch Holder dies. There should be a game over for cheaters, but chances are, if you're a cheater you don't have the good sense to penalize yourself for naughty behaviour. You know who you are. 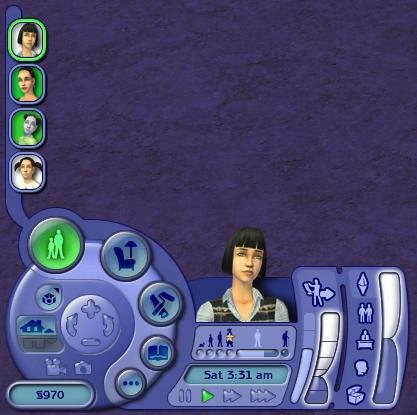 Start with a single Adult or Young Adult Sim. Alternately, for a truly random experience, you may move a non-playable teen townie to college. If you do so, you may not change anything about them! If in College: Move them into whatever type of housing you'd prefer. If you move them into housing containing playable characters, you may play those other characters as you normally would. If NOT in College: Move them into a new house/lot with no other residents. Choose any lot size you fancy. Finding a Mate for Your Founder. *If your founder is a Young Adult, and they fall in love with a University Townie/NPC, you must wait until your sim graduates to move them in with you. Obviously, if they fall for a Neighborhood Townie/NPC, they'll have to wait until graduation too. *If your founder is an Adult, they can marry N.Townie/NPCs or U.Townie/NPCs. *There's one exception to the Townie/NPC marriage rule. If your sim fancies a Maxis-made sim that you have never played (, in that incarnation, for those of you who restart a lot), it's all good. Ex: Torch Holder meets Lazlo. Torch Holder fancies Lazlo. You have yet to touch Lazlo either ever, or since the last time you restarted Strangetown. Go get 'em! *Once you finally have another sim in your house, the fun really begins! For each lifestage of your non-torch holders, you are allowed one command. Once that lifestage is over, so is the chance for that single command! When preparing to use your single command, press the Live Mode button to retract your toolbar. The ONLY personal info you should be able to see in the retracted state is their age, aspiration, influence, and aspiration level. After you're sure it's in the right position, select your non-torch holding sim and select one command. *You may X out the current queue before selecting your command. *You may NOT select a macro as your command. It must be a single action command. *You may NOT use this command to reroll LTW, Max Interests, ect. *You may NOT save up command chances from lifestage to lifestage. If you don't use it, you lose it! *If a glitch takes a strong hold of your NTHs (non-torch holders), you can to direct them to do whatever necessary to remedy the issue. Always remember to keep the toolbar retracted while you have a NTH selected! So you're going to use a NTH's free command to get a job, eh? *If you roll 1-2, select the first job listing. *If you roll 3-4, select the second job listing. *If you roll 5-6, select the third job listing. For ALL sims, not just NTHs, you cannot choose 'Ignore' for any chance cards you get. You must play them... Good luck. There's no way to complete this game without introducing new generations. Concerning Aspirations: Roll a die to determine their aspiration upon reaching teen-hood. The numbers you assign to each aspiration doesn't actually matter (I use the Legacy Challenge numbering system myself), just as long as you actually stick to that one way. If you roll your spare/unassigned number, roll again. Sorry, no 'Choose Your Own' stuff here. The Heir: When you get the first pre-birthday announcement that your heir is going to become an adult, you can now pass the torch to them. Keep in mind that once you hand over the torch, you can NEVER GO BACK to your former torch-holder. This is a sad moment indeed... However, if you are awesome, your former TH (torch-holder) will already be in permanent platinum, and at the top of their career. Decide now on whether you want to send them to college, or prepare them for their birthday into adult-hood. If you've managed to get them a (mutual) love interest by this point, you can send their love to college along with them, or move them in and grow them up if the TH is not going to college. No teen 'intended's. They must be in love to grow up with the TH. If your heir brings their love to college with them, you may control their love throughout college as you would with any other sim, then give up control of them once you've moved them back to the base neighborhood. Concerning University Aspiration Changes: When your heir gets to the point in college (If you send them) where they are offered the chance to change aspirations, you may roll for a new one if you wish to do so. Concerning Interests and LTWs: You may not change their LTW, or their interests, ever. And that Useless Spare? : Once the heir has taken the torch, the spare becomes void. If the new TH dies, shame on you, it's still an automatic game over regardless of the existence of the spare. Spares can only replace the heir if the heir dies before coming into his/her age-of-awareness and inheritence of the torch. *Let them remain in the house, clog all your toilets, and rot on the couch until their end. *Ship them off to college via neighborhood view access. *Use their command chance to apply for scholarships and send them off to college. *Use their command chance to find their own place. *If you manage to make them fall in love (must be mutual love) with someone, you can now take control of them regardless of whether or not they have command chances, but must move them out in a timely fashion. Once they move out, they are forever free, and can never return to the household. From here: wash, rinse, and repeat. *Amatuer - Successfully pass on the torch to the 5th generation. *Average - Successfully pass on the torch to the 10th generation. *Expert - Successfully pass on the torch to the 15th generation. *Supremely Awesome - Successfully pass on the torch to the 20th generation. Points? More like a Tally System: Keep tally of these events, then share them either at the end or to post your progress. Ask Socials: Here's what you can use, and what you can't as far as the new "Ask" socials go. *Do you want a ride home? *Do you want to go back to my place? *Do you like what you see? *How much money do you have? Feel free to scope the room, or even hire the matchmaker, but remember this! Never, ever, expand your date's wants through the Date Meter! *Keep in mind that cars can be assigned to sims without having them selected, which should certainly come in handy. *Vampirism is allowed, but I beg you to think long and hard before you try it. In my opinion, that's an accident waiting to happen (for non-torch-holders that is). *Remember that spare number when rolling for aspirations? Now you must assign it to the Pleasure aspiration. *Turn-ons and turn-offs appear to be adequately randomized when growing into a teen, please correct me if I'm wrong, therefore it must be left on what was randomly chosen! *The Re-Nu-Yu Senso Orb aspiration reward can only be used to access the Grilled Cheese aspiration, and nothing else! *The Re-Nu-Yu Porta Chug can never be used. *This wasn't originally intended to be an allowable part of gameplay, but since I completely overlooked it and some savvy players found it, I decided to acknowledge it as a legitimate game tactic. As some of you have realized, your NTH sim's LTW can be accessed even with the toolbar retracted. Thanks to some sneaky loophole-finders, and my own forgetfulness, you may all benefit from this trick. *As long as their toolbar is retracted, feel free to select your NTH regardless of whether or not you're issuing a permissable command. This is helpful is you want to know precisely where their aspiration level is. *Homework is easily the most aggrivating aspect of this challenge, and a very good incentive to have small families. Coax kids out of their current activities with a game of red hands, as it is a quick social interaction that gives them a significant fun boost, then queue up the 'help with homework' command while they're still playing so they don't have time to run away and conveniently occupy themselves. ;) Also, though this is a bit tricky, most children will have the want to do their homework in the morning if they haven't done it the night before. Helping them with their homework every day before school is a good way to keep their aspiration level pretty, but make sure you can get it done before the bus arrives. *No Food Spoilage?-I went back and forth with this one for a while, trying to decipher if it was too much of a cheat. With consideration of the inventory trick, and new word that sims will be able to save leftovers in the fridge with the next expansion pack (which should have been the case from the beginning), I decided that the no food spoilage hacks, or hacks that simply prolong the time it takes for food to spoil are perfectly reasonable. The ones that make food never spoil are a tad outlandish, but since the normal lifespan of leftovers is a week and no group meal ever takes that long to get finished in the sims I figured there's nothing wrong with it. Especially since food basically becomes immortal with the use of the inventory. Besides, who ever heard of food left on the counter spoiling in 3 hours? *Make Selectable?- It was trickier to decide whether or not this one should be made taboo or not, benign as it may sound initially. Then I decided, as long as their toolbar is retracted and you're not issuing any illegal commands, why the heck not? This does give you a clear advantage if you know precisely how to use it, but I'll let you try to figure that out on your own. Generally speaking, it's nice to make over potential spouses who happen to be NPCs when your TH has appearance related turn ons since the game won't let you make them over through normal gameplay tactics. Mind you, this does NOT mean you can make a non-ISBI sim selectable in your ISBI household and start controlling them as you would on their lot.. ISBI lot, ISBI rules, and that's final. Just in case I get too wrapped up in the excitement of the Seasons pack to update the rules in a timely fashion, I want to say this now... After reading everything I can get my hands on, it sounds like weather may potentially be highly dangerous for autonomous sims. You may obviously have them dress accordingly, as changing appearance is already permitted in the rules, but since I strongly doubt they'll know it's not a good idea to then go swimming in an outdoor pool in the middle of winter regardless of the fact you just told them to put on their coats and ear muffs, I'm setting up a temporary rule that you can command them to "go here" at anytime after installing the Seasons pack if they're doing something seasonally inappropriate/dangerous.. This rule may or may not remain intact after I evaluate their ability to prevent themselves from freezing or heat stroke. If your lot gets too glitchy, just toss it. Don't bother re-killing all those sims unless you really want to. Remember that this challenge isn't meant to be so much about your end distribution of points as it is about the journey to it. What I'm really interested in hearing about is the highs and lows of the players. Brag or lament.. You've earned it. Due to the astounding amount of spam, comments are no longer allowed.